There is this old joke, or perhaps one may say it’s more of a religious parable. In either case, I’ve known this tale for so long that I can no longer remember the first time it was told to me, nor the number of times I have thought of it since. In many ways, it’s a silly story, but to me, it has always been powerful, and its message has guided me at many stages of my life. “No thanks” replied the man. “I’ve prayed to God and I’m sure he will save me”. There it is…”you never got in.” Why didn’t he get in? How was he expecting to be saved? Had the man become so focused on how he had envisioned being saved that he ignored opportunity after opportunity to embrace another way? How often in life do we turn a blind eye to opportunity because it is not what we were expecting for ourselves? In how many situations are we presented with alternate paths that we don’t even notice because we’re so fixated on how we think things should happen. We do it in our relationships, our careers and even to ourselves. We get so locked into visions of what “SHOULD” be that we miss out on what “COULD” be. I believe that “should” is a dirty word. “Should” comes from society. “Should” comes from etiquette books from 1950. “Should” comes from old-school, close-minded ideas that say we are all meant to conform. “Should” comes from that little voice inside our head that loves to tell us that we’re not good enough. We need to stop the madness. No more “shoulding” on ourselves! For several years, I taught at a local university, which was a very eye-opening experience for me. I loved teaching and I was blessed to have so many students share their life stories, their goals and even their fears. It was during this time that I truly realized what a shame it is that we put such pressure on kids to decide what they want to do with the rest of their lives while they’re still in their teens. The majority of the incoming students choose majors that “should” earn them a good job, a good salary, security or respect. All things they have such little experience with yet. In most cases, they’re not choosing based on passion. They’re barely 18 years old! They haven’t had a chance to explore life, never mind figure out what they are truly passionate about yet. Instead, they’re often left to choose what they think they “should” do, and then hope for the best. As a result, I found many a student struggling because it was material that just didn’t resonate with them. I tutored several young students who were taking the subject for the 3rd or 4th time, hoping to pass. I also taught continuing education classes for adult students who came from existing careers and made the decision to go back to night school to pursue their true passions. Those classes were so much fun to teach because the room was always filled with the amazing energy of what “could” be, from those who made the decision to embrace it. From those who got in the boat. I personally spent a big chunk of my life standing on the roof, watching the “should” waters rise around me. Then one day I took a chance on a different vision, and this is where I get to tell you that following your heart is not always easy. Its downright scary, and its surely not always free from heartache, but it is so worth it. It is liberating. It is exhilarating. It is inspiring. So ask yourself today where you are sabotaging your own salvation by holding on to ideas of how you should get there. Find time to sit quietly in meditation and ask your soul if you are truly happy. Ask your heart if it beats with passion and joy for the work that you do. Ask your mind if you are really open to new ideas and visions. 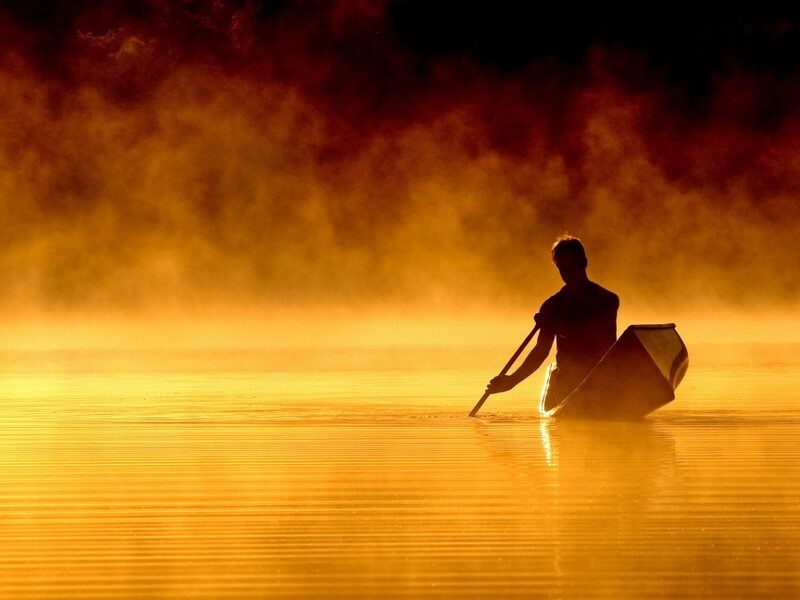 Sometimes we just have to let go of what we think should be and instead follow the feelings that tell us “this relationship isn’t healthy for me,” or “this job makes me unhappy,” or “there may be a better way than what I had originally planned.” Put aside the ego, the visions and the plans to just get in the boat and enjoy the journey.